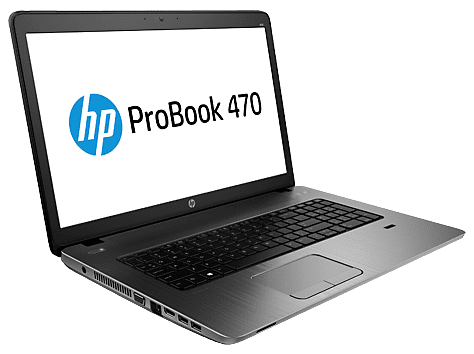 HP ProBook 470 G2 is targeted at business users who require a rugged laptop with features that gets the job done every time while keeping their minds at ease. The elegantly-designed notebook packs a massive 17.3-inch display and a powerful processor as well as useful features for security, management and collaboration. The HP ProBook 470 G2 features an eye-catching design with a soft touch paint finish and brushed aluminium material used for the keyboard deck. The behemoth has a starting weight of 2.84 kg and a thickness of 26 millimetres. It is designed to be reliable having passed through 115,000 hours of HP Total Test Process. HP ProBook 470 G2 laptop has a spill-resistant, backlit keyboard. It is fitted with a large 17.3-inch diagonal display with HD+ (1600 x 900-pixel) resolution or an optional Full HD (1920 x 1080-pixel) resolution. The screen has anti-glare feature which will ensure enjoyable use when outdoors. The large business laptop is kitted with blazing fast fourth-generation Intel Core processors. Different configurations of the HP ProBook 470 G2 come with Intel Core i3, i5 and i7 chips. Standard system memory is 4 GB, upgradeable up to 8 GB. Integrated Intel HD Graphics 4400 and a discrete AMD Radeon graphics card with dedicated video memory of 1 GB or 2 GB handle the task of crunching graphics. HP ProBook 470 G2 comes with Windows 8.1 (64-bit) operating system and further options of Windows 7, Ubuntu Linux and FreeDOS 2.0. Storage is handled by a 7200rpm SATA hard drive with capacity ranging from 500 GB to 750 GB or a 5400rpm hard drive of 320GB to 1.5TB capacity. The notebook can also be configured with a solid-state drive of up to 128GB capacity. HP ProBook 470 G2 supports Bluetooth 4.0 and Wi-Fi 802.11 a/b/g/n/ac (both single and dual band). It has two USB 3.0, two USB 2.0, one HDMI and one VGA ports as well as one multi-format digital media card reader, amongst other ports and interfaces available. Security and management tools include integrated TPM 1.2, HP BIOS protection, HP Client Security, HP DriveLock and an optional fingerprint reader. There are also integrated stereo speakers with DTS Sound and an optional webcam. HP ProBook 470 G2 laptops are not yet available in Nigeria. HP ProBook 470 G2 price in Nigeria is expected to start at around N160,000, depending on your location and the configuration of the laptop.